Fourth Row Center: Film Writings by Jason Bailey: In Theaters: "Sweetgrass"
Sheep are funny. Early in Sweetgrass (two shots in, if memory serves), a large group of them faces directly into the camera, and the shot is framed and held in such a specific, quirky way, you can’t help but laugh. Later in that pre-title sequence, one of those sheep is regarded in a long close-up; it eventually turns and looks right into the camera, chewing. The effect is absolutely disarming, and begins this unconventional documentary on exactly the right note. I’d imagine that if you took a poll of, say, ten friends, and asked each of them to describe their level of interest in watching a documentary about sheep herders, you’d end up seeing that movie alone. In its conception, Sweetgrass sounds almost comically esoteric (“All right hippies, you think you like documentaries? Try this”). But it has a deliberate, elegiac style, and in many ways it proves the old maxim that the way to get people to listen closely is to speak quietly. 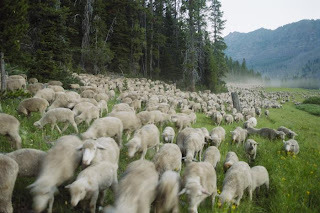 It is, in fact, a Western—these sheep herders among the last cowboys, and their 150-mile sheep drive through Montana doesn’t even exist anymore (the film was shot between 2001 and 2003). But it’s not a straight-forward documentary portrait—to begin with, the on-screen text that contains that information closes the film, rather than opening it (as most docs would tend to do). There is no narration, no interviews, no music. It is not, to put it mildly, a film that is in any particular hurry. It is not “about” these men, or their job; it is more like a snapshot of these moments, brought to vivid life. And what snapshots. Early on, we have a startling sequence in which we watch sheep getting sheared before the drive, and it happens in long, continuous takes, in which the wool comes off seemingly in one, effortless stroke; we marvel at the skill and proficiency of these men. Afterwards, there is a haunting image of freshly shorn sheep, dozens of them, standing motionless in a field as the snow falls around them. It’s a shot that kind of takes your breath away. The expansiveness of the photography (which is somehow beautiful in spite of the fact its low-end digital video origins, proving that you can make a great-looking movie on just about any format) is particularly stunning during the drive itself. The massive herd trots down a small town’s main street, the plainly visible Radio Shack storefront confirming the anachronistic nature of the tableaux. The sheep get stuck in a tricky, impenetrable pass, and the filmmakers’ birds-eye view is contrasted with a moving shot from ground level, with braying sheep on all sides. An extreme wide shot, from a considerable distance, shows exactly how the cowboys and their dogs move the temperamental sheep up a hill; all we can make out is white specs moving en masse, while the frustrated cowboy shouts inventively-organized profanities. Almost in spite of the impersonal, detached style, we get a sense of who these men are. John, the grizzled, aged cowboy, is a real character; his observations are candid (and often hysterical), as are his interactions with his younger counterparts. One of those men gets the closest thing the film offers to a confessional, as he finds a point on a mountain high enough that, if he stands on a pile of branches, he can get good enough cell phone reception to call his mom and lament the horrible shape he’s in (it’s a painfully open scene, and the filmmakers decide to spare him any humiliation by panning deliberately across the landscape while the call is heard). Sweetgrass is directed by Ilisa Barbash and Lucien Castaing-Taylor; they spent the better part of the previous decade on it, and their dedication and determination shows in the uncompromising final product. With its lengthy, unbroken shots and eschewing of traditional documentary devices, some audiences will no doubt find it off-putting, if not achingly dull. But I was fascinated by it. Yes, it could certainly be tighter, and I would be lying if I said that my mind did not occasionally wander while watching it. But I’m not entirely sure that’s not supposed to happen (Zen and the Art of Sheep Herding? ); it’s the kind of film that engages you with its images, and lets you linger on them and contemplate them for a while. I’ve never seen a film quite like it, and I’m willing to bet I won’t for quite some time. "Sweetgrass" opens Wednesday, January 6th at New York City's Film Forum. On DVD: "United States of Tara- Season 1"
Kael of the Week: What's Missing?